Though the musical Mean Girls is nominated for a dozen Tony Awards, no Tonys are given to Broadway choruses. Kamille Upshaw is pictured in the bright green jacket, right of center. 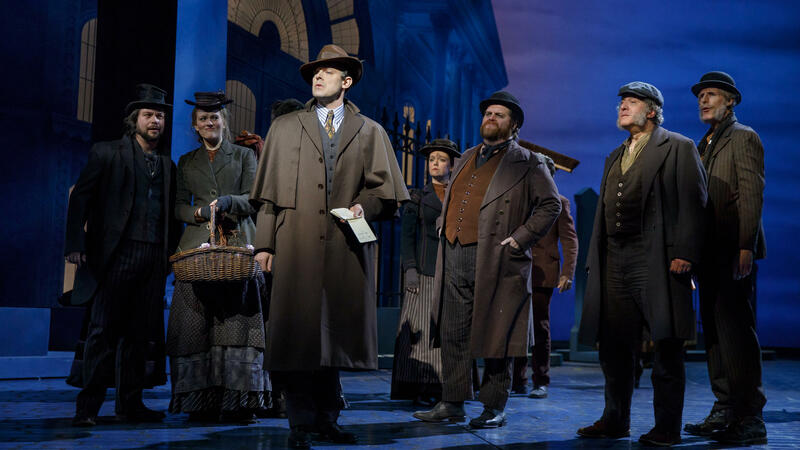 In the recent production of My Fair Lady, Broadway veteran John Treacy Egan (bearded, just right of center) plays a number of roles within the chorus, including a singing street vendor. Remember A Chorus Line? The immensely popular 1975 musical looked at the stories of some of the people who often work completely anonymously on Broadway. Tonight, the 2018 Tony Awards — Broadway's highest honors — will be handed out in a ceremony at Radio City Music Hall. Lead and featured actors in plays and musicals will win prizes. A Chorus Line was nominated for 12 Tony Awards in 1976, and won nine. But the performers in real-life choruses aren't even eligible to win. Kate Shindle is president of Actors Equity, the union that represents actors and stage managers. She says chorus members not only sing and dance, but sometimes play instruments or move scenery. "Often the hardest-working people on stage, in a lot of respects, who could never really be recognized for that work," Shindle says. Equity wants to change that. It's petitioning the Tony administration committee to consider awards for not only choruses, but their counterparts in plays, known as ensembles. "There is a misperception, I think, sometimes in our industry, that everybody's trying to be a principal actor — everybody wants to be in the light by themselves singing," Shindle says. "And that's not the reality. There are also people who go from show to show to show, and they're not trying to get their name above the title. They just want to be a part of the community." "I'm one of the four costermongers who are sort of just in the street scene in Covent Garden where we meet Eliza Doolittle," Egan says. "And then get to sing that beautiful four-part harmony of 'Wouldn't It Be Loverly' with her, which is great." Egan gets a few solo lines in the show, but most of the time he's one of 25 chorus members. Before the show, he changes costumes in the depths of Lincoln Center Theatre's basement — a little hair gel in the hair, a little eye black — and heads back upstairs to the wig room. He needs his muttonchop sideburns quite literally slapped on. "Yeah, she has to smack them, to make sure they stay on," Egan says. "If she just puts them on, I don't really know." My Fair Lady is a fairly typical musical from Broadway's golden age. Egan is in several numbers, but has a lot of downtime between long scenes that feature the lead actors, or principals. 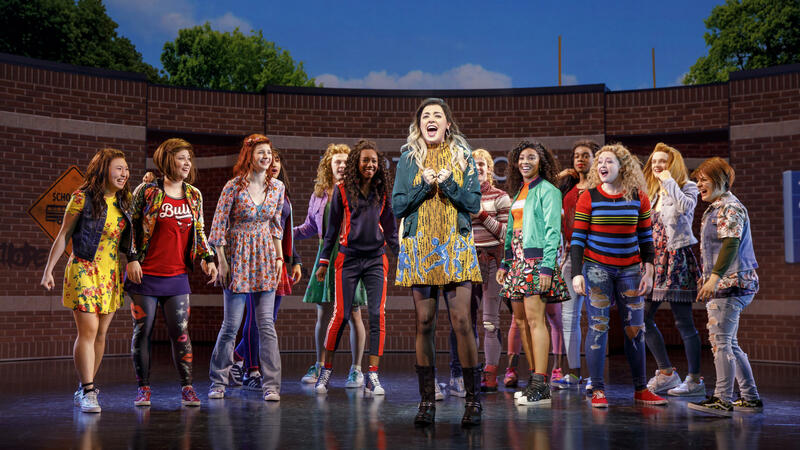 Over at the Tony-nominated musical Mean Girls, set in a high school, the pace is quicker. The chorus is onstage almost all the time, says Kamille Upshaw, a Juilliard-trained dancer, as she limbers up before the show. "And if we're not onstage, we're changing, which is just as tiring," Upshaw says. "If we could just sit for two seconds, that would be nice. But we don't have that luxury." This is only Upshaw's second Broadway show — her first was Hamilton. "The thing about both the shows which I really love is that the ensemble's used to its capacity as a storytelling mechanism," she says. "And that's to create a world around what's happening with the principals." In other words, the chorus or the ensemble isn't just stage dressing. Upshaw and Egan have created their own characters, with their own personas. And Egan says, while they're onstage, standing behind the leads, they have to look like they're talking about something that has to do with the show, even if they're not. "You can be talking about where you're going to dinner, but you have to make it look like you're talking about something that's happening on stage," Egan says. "The audience can tell, if they're looking." What happens backstage is as important as what happens onstage, says Mean Girls' Kamille Upshaw. "It's very choreographed, as well," Upshaw says. "You have to know where to stand. You have to know when this prop goes off. We move everything in the show, so we move the lunch tables. These things are hea-vy. So we had to develop a system as to how we could do that as a unit and not be injured and for it to run smoothly." "Broadway's hard!" she says, laughing. "It is. It's hard. But I love what I do, so it makes it very easy to come to work every day." For his part, John Treacy Egan says that even though he's been performing on Broadway for 20 years, he still gets goosebumps. "Sometimes you wake up and you go, 'Oh my gosh, I'm going to go be in a Broadway show today,'" he says. Both Egan and Upshaw will be seen on the Tony Awards broadcast tonight, even though they won't be eligible to win that shiny medallion. Yet. Tonight, the 2018 Tony Awards, Broadway's highest honors, will be handed out at Radio City Music Hall. They'll go to lead and featured actors in plays and musicals but can't go to some performers who shared the stage with those leads. Jeff Lunden went to find out why the chorus of a musical might deserve its own Tony Award. JEFF LUNDEN, BYLINE: Remember "A Chorus Line?" UNIDENTIFIED ACTORS: (As characters, singing) One singular sensation every little step she takes. LUNDEN: That immensely popular 1975 musical looked at the stories of some of the people who often work completely anonymously on Broadway. Kate Shindle is president of Actors Equity, the union that represents actors and stage managers. She says chorus members not only sing and dance but sometimes play instruments or move scenery. KATE SHINDLE: Often the hardest-working people on stage in a lot of respects who could never really be recognized for that work. LUNDEN: Equity wants to change that. It's petitioning the Tony Administration Committee to not only consider choruses for awards but their counterparts in plays known as ensembles. SHINDLE: There is a misperception, I think, sometimes in our industry that everybody's trying to be a principal actor, and that's not the reality. There are also people who go from show to show to show and they're not trying to get their name above the title. They just want to be a part of the community. LUNDEN: That's a perfect description of John Treacy Egan, a burly actor with a sweet voice. He has played lead roles on Broadway, but in the Tony-nominated revival of "My Fair Lady," he's in the chorus, alternating between a snooty, upper crust lord and a cockney street seller. JOHN TREACY EGAN: I'm one of the four costermongers who are in the street scene in Covent Garden where we meet Eliza Doolittle and then get to sing that beautiful four-part harmony of "Wouldn't It Be Loverly" with her. UNIDENTIFIED ACTORS: (Singing) Wouldn't it be loverly. EGAN: (As costermonger) Where ya bound for this spring Eliza? Biarritz? LUNDEN: Egan gets a few solo lines in the show, but most of the time he's one of 25 chorus members. EGAN: We're down in the dungeon. LUNDEN: He changes costumes in the depths of Lincoln Center Theater's basement. EGAN: Some little gel in the hair so I don't look so freshly washed. LUNDEN: He needs one more touch before he can go on stage. He heads back upstairs, down another hall, to the wig room to get mutton chop sideburns slapped on. EGAN: She has to smack them to make sure they stay on. UNIDENTIFIED PERSON: Hey, hey, everybody, this is five minutes, five minutes to curtain call please. UNIDENTIFIED PERSON: Five minutes, five minutes. EGAN: Now my call is five minutes, so we're ahead of the game. LUNDEN: And five minutes later, the show starts. LUNDEN: "My Fair Lady" is a fairly typical musical from Broadway's golden age. Egan's in several numbers, but he has a lot of downtime in between long scenes that feature the lead actors, or principals. BARRETT WILBERT WEED: (As Janis Sarkisian) Now you know, Cady, Regina George is not your friend. We're your friends. LUNDEN: Over at the Tony-nominated musical "Mean Girls," set in high school, the pace is quicker. The chorus is on stage almost all the time, says Kamille Upshaw, a Juilliard-trained dancer as she limbers up before the show. KAMILLE UPSHAW: And if we're not on stage, we're changing, which is just as tiring. If we could just sit for two seconds, that would be nice, but we don't have that luxury. LUNDEN: This is only Upshaw's second Broadway show. Her first was "Hamilton." UPSHAW: The thing about both of these shows which I really love is that the ensemble's used to its capacity as a storytelling mechanism, and that's to create a world around what's happening with the principals. LUNDEN: In other words, the chorus or the ensemble isn't just stage dressing. Upshaw and Egan have created their own characters with their own personas. And Egan says while they're on stage standing behind the leads, they have to look like they're talking about something that has to do with the show even if they're not. EGAN: You can be talking about where you're going to dinner, but you have to make it look like you're talking about something that's happening onstage. The audience can tell if they're looking. LUNDEN: And what happens backstage is as important as what happens on stage, says Kamille Upshaw at "Mean Girls." UPSHAW: It's very choreographed. You have to know where to stand. You have to know when this prop goes off. We move everything in the show, so we move the lunch tables. These things are heavy. So we had to develop a system as to how we could do that as a unit and not be injured. Broadway's hard (laughter). It is. It's hard, but I love what I do so it makes it very easy to come to work every day. LUNDEN: For his part, John Treacy Egan says even though he's been performing on Broadway for 20 years, he still gets goosebumps. EGAN: Sometimes you wake up and you go, oh, my gosh. I'm going to go be in a Broadway show today. LUNDEN: Both of them will be seen on the Tony Awards broadcast tonight even though they won't be eligible to win that shiny medallion yet. For NPR News, I'm Jeff Lunden in New York. Transcript provided by NPR, Copyright NPR.